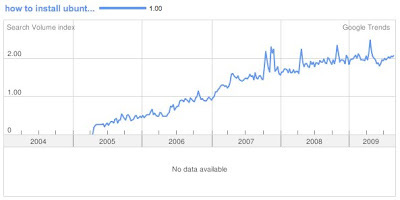 The graph above taken from Google Trends shows that a growing number of people are searching for the term: how to install Ubuntu. The steep climb only proves that Ubuntu's popularity is exploding, and the way that it's going, the growth is sustainable. Perhaps it is another good example that can explain why Microsoft is so afraid of Linux nowadays. In addition, a recent data that I've posted here tells us that Ubuntu has become more popular than Windows XP. 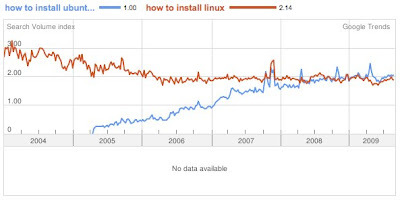 Comparing the search-terms "how to install Ubuntu" with "how to install Linux", you will notice that the search volumes are now equal. Does this mean that Ubuntu has become equally or more famous than Linux itself? Based on the data, they are almost the same now. But the trend shows that there's a big possibility that Ubuntu will eclipse Linux's popularity any time soon. Now, for those of you who came here via the search term "how to install Ubuntu", you can go HERE. --It's a link to a documentation page that will give you more than enough information about Ubuntu, and on installing it of course. If you are a complete newbie, I recommend that you read my HOW TO USE LINUX post. That's about it. After Ubuntu, feel free to try other flavors of Linux like Fedora, PCLinuxOS, Mandriva, openSUSE, and a whole lot more. Have fun! The graph shows pretty well zero growth over the past year. Hardly and explosion. And let's face it, Microsoft fears Ubuntu about as much as an elephant fears a mosquito.